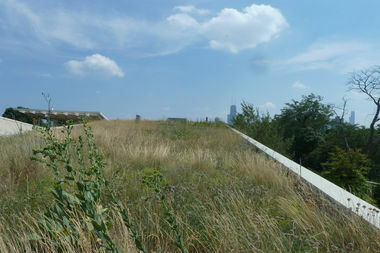 With Big John and the Sears Tower in the background, the green roof at the Notebaert Nature Museum provides sanctuary to prairie grasses. LINCOLN PARK — A new web-only nature series from WTTW-TV will take city residents to an idyllic location they've most likely never been before — the green roof at the Notebaert Nature Museum. "It is kind of like you're on a prairie," said Dan Protess, writer and producer behind the 16-part "Urban Nature" series, which went up Friday on the WTTW website. "You just happen to be up in the sky in Lincoln Park. "It's too bad, I'm sure for liability reasons, they don't want the public on the roof there," he added. "But the roof of the Notebaert has some of the most amazing views of the skyline." It also serves an amazing purpose. Northwestern University doctoral candidate Kelly Ksiazeck-Mikenas explains in the "Rooftop Refuges" episode that it serves as a sanctuary for prairie grasses. 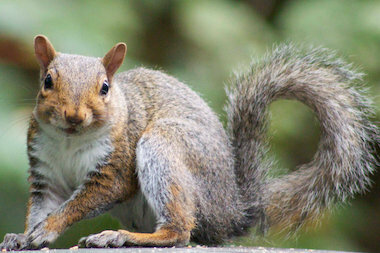 Why do gray squirrels lord it over fox squirrels in Chicago? You'll have to watch WTTW's "Urban Nature" series online to find out. She points out that 99 percent of the prairie landscape from the 1800s before Chicago expanded has been lost, "so there's not a lot of space for these plants to live." They thrive in the rooftop garden, however, and also absorb more water than the typical sedum plants one might find atop a skyscraper Downtown. "We know that green roofs cool buildings and absorb rainwater, but scientists are asking whether or not they might provide refuges for wildlife," Protess said on a conference call Thursday with show host Marcus Kronforst, a professor at the University of Chicago. Protess said a running theme in the "Urban Nature" series is "the city being a refuge for wildlife." "We're becoming more and more interested in this concept of urban nature and the ecology you find right outside your back door," Kronforst added. "Working on these 16 different stories, it was really incredible to see the extent of nature in these urban settings." The series also finds examples in New York City and San Francisco, but in Chicago it has episodes on how some people are trying to improve the plight of migrating birds and butterflies. For instance, Kronforst said, milkweed is being increasingly planted to sustain migrating monarch butterflies, while a "lights out" program systematically dims distracting skyscraper lights during migration season for birds. They also talk with architect Jeanne Gang, who discusses how she adopts "bird-friendly features" into her buildings, such as ways to create "visual noise" to keep birds from flying into windows. And they follow bird-collision monitors who scan the city before dawn for birds that haven't been so lucky, sending injured survivors to a suburban wildlife hospital. In other episodes, they examine the ecology hidden within vacant lots — "You could seed them to grow like a grassland," Kronforst said — and relatively untouched natural areas along the Calumet River. The Calumet region, Kronforst said, offers "what the Chicago area might have looked like if we went back in time before it was developed." "Steel plants right next to marshes," Protess added. In "The Great Squirrel Mystery," they check out the findings of a University of Illinois at Chicago professor who says fox squirrels and gray squirrels are as segregated as the races in Chicago. "Gray squirrels tend to live in wealthier neighborhoods," Protess said, "and fox squirrels tend to live in less-affluent areas." Why? They said you'd have to watch the episode online to find out. According to Protess, they had to leave a bunch of interesting material on coyotes on the cutting-room floor, but that was a rare victim of the series being set for the internet and not broadcast television. Protess said he didn't feel at all slighted by the internet-only assignment. "It absolutely does offer a lot of freedom," he said, "stories as long as the stories want to be," most ranging from 4-8 minutes, with the entire series clocking in at about 1 hour and 40 minutes. "Also, it's just kind of where viewers are going," Protess added. "I think it's good we're trying to reach viewers where they are."